H.N. Werkman (Dutch, 1882 – 1945) was an artist and technician ahead of his time. Investigating fine art ideas related to form and typography, Werkman composed prints and small press booklets on the bed of his iron handpress. Incredibly complex, these prints and books were often regarded by Werkman’s contemporaries with puzzlement. 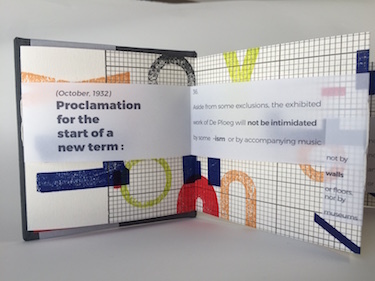 Proclamatie is an artists book in homage to H.N. Werkman. Much of the design work took place on the bed of the press, allowing for spontaneous design decisions during the process. True to Werkman’s methods of working, the project included “unrehearsed” techniques such as stencils and hand stamping. 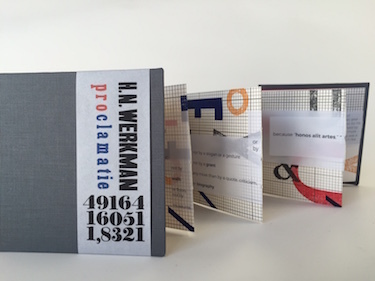 The text is taken from Werkman’s manifesto Proclamatie (Proclamation), originally published in 1932. 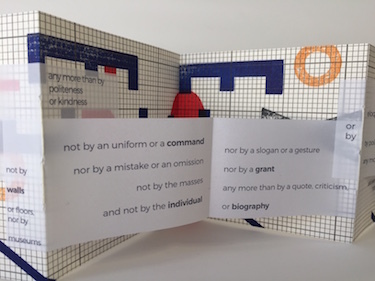 As a “near-native” of San Francisco, Jennie Hinchcliff has been creating artists books since 2000. Her works can be seen in the collections of the Whitney Museum of American Art's Special Collection, the Cooper-Hewitt National Museum of Design, and the Franklin Furnace Archive (among others); her work often explores the beauty of small details and incorporates obscure materials which speak of other eras.